With retailers like Wal-Mart and e-tailers like Amazon.com in a virtual street brawl to win your dollars this holiday shopping season, there’s bound to be a deal or coupon out there for the items on your list. But the barrage of advertised specials and online “coupon codes” for Black Friday and Cyber Monday—the Friday and Monday following Thanksgiving—can quickly overwhelm. According to Shop.org’s eHoliday Survey, about 87 percent of retailers will have some type of Cyber Monday promotion this year. About 43 percent of these promotions will be specific deals, while one day sales will account for 33 percent of the deals, and nearly 16 percent will be offers of free shipping on all purchases. How do you find that code for a favorite merchant? Can the coupon be used only on the Web or printed and brought in to a store at the local mall? And is that discounted navigation device (“GPS”) really a bargain, or just a low-priced leftover that is about to be replaced by a newer and better model? There are websites dedicated to finding and sharing all the deals from almost any major retailer or e-tailer you can name, offering coupons and discount codes that can be used either online or in-store. And some sites go further, to advise you on why the offers they show are good, middling or bad values. There’s even an add-on application from Billeo for Web browsers that turns Google, Bing and Yahoo! into bargain hunters, finding offers based on the keyword you enter in their search fields. Yet the array of bargain finders can overwhelm, too. So we did a bit of advance digging for you, and uncovered some we suggest you check out online today—before you’re in line to check out the goods tomorrow. BradsDeals.com employs a team of bargain hunters who scour the Web and printed advertisements and circulars for both coupons and what they consider the best values, among special offers in 58 product categories, including electronics, jewelry and kids toys. On Wednesday morning, the site offered 3,489 coupons, and 245 “handpicked deals” for 1,193 stores. About half the coupons on the site are exclusive to BradsDeals, given specifically to the site by merchants. The BradsDeals home page clearly organizes the coupons in separate sections; one covers “printable” coupons to be used in stores, the other “online” discount codes to be used at e-tailers. Each listing includes the coupon’s expiration date as well as any rules or limitations. Meanwhile, the handpicked deals are organized into three areas of the home page, for Top Deals, Most Popular and Newest. And each deal listing includes product information and some editorial explaining why the BradsDeals team believes it is a good value. 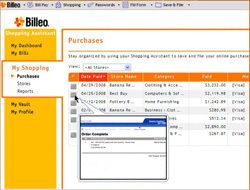 A search field at the top of each page allows the user to look for a specific product or a specific store, and if there is a deal associated with either, it will be shown. When possible, BradsDeals also guides users on how to combine offers. For example, one listing yesterday highlighted the Panasonic 54-inch Viera S1 Series Plasma HDTV on sale at Sears for $1,099.99, and noted it is a good deal—among other reasons—because Amazon was selling the same TV for $1,399. In addition, the listing provided some of the TV’s technical specifications. Advice for shoppers included choosing in-store pickup to save the $65 shipping fee, and to charge the purchase to a Sears credit card, which gives an additional 10 percent discount for purchases over $699. Each deal’s own Web page also shows prices for the same product at competing sellers, as well as related coupons. Updates throughout the day warn about reduced inventory or inform the visitor when an item has sold out—and items that have sold out are pulled from the lists at the end of each day. Moreover, Brad Wilson, the site’s founder and editor-in-chief, says the site will respond to e-mails from readers asking for opinions on deals they have found themselves, or requesting BradsDeals to find deals on specific products they want. 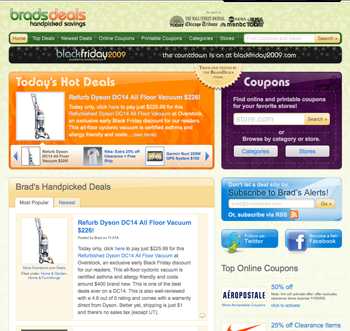 And now, BradsDeals is highlighting the site’s Black Friday-specific deals in a separate, dedicated site: BlackFriday2009.com. 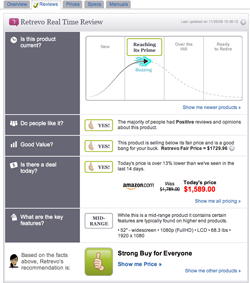 Retrevo.com is limited to consumer electronics products, but covers the field extensively, with informed analysis and commentary on products in 53 categories—including advice on whether any particular product is worth buying at all, whether it is part of a deal or not. Deals are accessible from two sections of the home page, titled Best Values and Bargain of the Hour, and the products in each are found by either Retrevo’s employees, who manually search the Web and store circulars, or by the site’s backend computers, which “crawl” the Web looking for specials. Each special found is then evaluated by the site’s computers, which use “artificial intelligence” to determine the offer’s value based on the product’s sale price relative to competitive prices, its price history, its “fair price” (determined by Retrevo), its features and specifications, and where it is in its lifecycle. When the sale price drops significantly and is below the fair price for the product, Retrevo flags the offer as a good deal, explains Andrew Eisner, director of content. I n addition, a “value map” at the top of the Best Values page shows dots depicting each listed product, showing its position along two axes: price range horizontally, and value from low to good vertically. Other products not deemed best values also appear in this value map. Clicking on any of the dots takes you to that product’s own page at the Retrevo site. You can search for Retrevo’s take on any consumer electronics goods you’ve already found elsewhere. A “real time review” on each product’s page includes both its fair price and a “lifecycle graph“ that depicts whether the product is new, “reaching its prime,” “over the hill,” or “ready to retire” and be replaced by its manufacturer with a newer and better model. An overall recommendation—thumbs up, down or sideways—also takes into account the opinions of people in the Web community, including Retrevo users, customers at e-tailers such as Amazon.com, and professional reviewers at other trusted sites. However, these community opinions play no role in Retrevo’s determination of a product’s value or a deal’s worth, Eisner says. Retrevo covers more than 100 retailers and e-tailers on any given day, he says, but the site does not offer coupons or discount codes, and does not indicate whether a product is still available or in limited supply. “Consumers need to be pretty cautious this season,” Eisner says. To help with Black Friday shopping in particular, Retrevo has created its own Black Friday Real-Time Resource Center, highlighting deals from 16 retailers and e-tailers. In late September, Billeo, Inc. launched a “browser app”—an add-on for Firefox (Mac and Windows) and Internet Explorer (Windows)—that shows the availability of online offers from merchants and credit card companies on the Web search results pages generated by Google, Bing and Yahoo! It tags the search results with offers embedded in small bars that contain the logos of companies offering related deals, and hovering the mouse cursor over one of these logos will reveal its deal. Search for, say, “Samsonite,” and a bar with a Visa logo and embedded cash back offer may appear next to a link to an online luggage store. At the checkout page, when you’re ready to complete the purchase, an on-screen pop-up box reminds you of the deal, and clicking on a “Get Offer” button in this box inserts the needed coupon code in the correct place. The app also can auto-fill your name, ship-to address, billing address and credit card information., if you’ve enabled this feature. Currently, Billeo will reveal offers from 650 retailers and the loyalty programs of American Express and Visa. Other loyalty programs are expected to be added shortly, says Murali Subbarao, the company’s founder and chief executive officer. Some online coupon sites are less like mainstream businesses and more like social media sites, where users congregate to share coupon codes and circulars they’ve found themselves. Beware, though: Some retailers may not accept coupons printed from these sites, which may not be authorized originals. 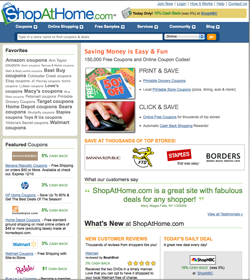 ShopAtHome.com offers coupons and cash back offers from more than 20,000 merchants. Some coupons have been uploaded by users and so are not guaranteed to work, whereas others were aggregated and verified by the site’s staff—but discerning which is which can be difficult. Printable and online coupons are distinguished on the home page, and it is possible to search ShopAtHome’s deals for a particular store, but not for a particular product. Now, there are more than 46,000 coupons at ShopAtHome, and cash back offers from 3,500 stores. To get the cash, you have to initiate the purchase at ShopAtHome, and the site will mail you a check only after you’ve accrued at least $20 of rebates, says Krista Paul, director of online marketing and public relations. However, that will be easier to do on Black Friday and Cyber Monday, when more than 100 merchants will be offering double cash back through the site, Paul says. There’s also a dedicated ShopAtHome Wild Deal site, offering a new limited time, limited quantity offer ever day. On Cyber Monday, ShopAtHome will be presenting a new special deal every hour, none priced higher than $40, and all at least 50 percent off their normal retail price, Paul says. One example, she says, will be a Sephora make-up kit that usually sells for $150. ShopAtHome also created dedicated Black Friday and Cyber Monday deals pages. 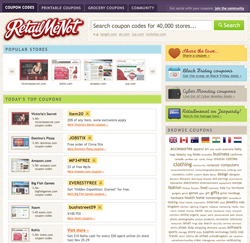 RetailMeNot offers 300,000 online coupon codes and between 100,000 and 200,000 more printable coupons, for 45,000 merchants. However, the vast majority of the codes were submitted by users, and therefore not verified, says Guy King, co-founder of the Melbourne, Australia, based company. However, he says, coupon distributors and merchants supplied most of the printable coupons. There are RetailMeNot Black Friday and Cyber Monday pages, too. Maybe more interesting, though, is the site’s Twitter Contest: Each time you tweet the name of a store and tag #retailmenot, you will be entered to win a $100 gift certificate to that store. (For example, tweet Gap #retailmenot.) The site will give away one $100 prize each day through December 22, King says. You must follow @retailmenot on Twitter to learn the names of the winners. Fashionistas may want to look for deals on designer apparel at online boutiques we’ve discovered (See Get Great Deals at Designer Discount Sites). Meanwhile, National Retail Federation retailers have come together to offer Cyber Monday deals at their own dedicated Website, CyberMonday.com. It will feature hundreds of offers, including some promotions available exclusively there, beginning on Black Friday and continuing throughout the holiday shopping season. Among these are a Deal of the Hour on both Black Friday and Cyber Monday (lists will be available in advance), free shipping specials, dollars off and percentages off, and free gifts with purchase. And, of course, retailers will be offering deals independently—at their websites, in e-mails, and in printed advertisements and circulars. There’s no doubt that coupons can help comsumers make some really big savings. I was interested to read your list of US sites - there are some really good and well-constructed options there. I’m involved in discount coupons here in the UK, although the market is not as developed. I think it’s more fun to shop when you’ve got coupons not to mention much cheaper. The whole discount code market seems to have gone crazy right now. There are a huge number of sites now appearing that cater to online/offline shoppers who are trying to save. The current state of global economics has made shoppers far more aware of the money that’s in their pockets. I have to disagree with ‘discount codes’ - the UK market is just as developed as the US coupon code sector. In fact, there are a number of UK companies doing very well from their websites catering to American shoppers. Normal coupon sites only gives you internet deals, I found a more interesting site which provides social media platform for us deal hunters to actually share instantly with friends once we have the deal. Pretty cool stuffs, check this hotel couponhotel couponslist out. This is last years info, will it be updated soon? Yes. We’ll definitely be updating this. Right now the plan is to have the new story up on Monday, November 22. Looking for the web’s best prices on all your holiday items? Try “FreePrice Alerts.com ”—it downloads onto your browser in seconds, then pops up the web’s lowest pricing on whatever you shop for—and it’s FREE! Totally worth trying, I saved over $200 on a Canon camera. Happy holidays people! !